(Release Date: August 12, 2014)  Following in the footsteps of their schmaltzy previous two nature docs, 2011's "African Cats" and 2012's "Chimpanzee," DisneyNature regains the dignity of their brand with the simple, sweet "Bears." The story is the opposite of hard-hitting, but the rapturous photography captured by directors Alastair Fothergill and Keith Scholey, as well as the inviting voice-over narration by John C. Reilly (2014's "Guardians of the Galaxy"), make it worth a visit. Rising from winter hibernation, mama bear Sky leaves her den to journey with cubs Scout and Amber across the snowy mountains of the Alaska Peninsula for the lush valley below. Set over the course of the spring and summer seasons, Sky and her children search for food, learn to defend themselves against a preying grey wolf, and spar against alpha-male bear Magnus. As with all of nature's creatures in the wild, survival is not guaranteed. "Bears" spends too much time in the second half observing Scout and Amber as they frolic around without much else happening, but watching the fierce protectiveness of Sky and the diverse relationships between all of these animals is enough to pull in the viewer. Not without its contrivances as it caters to younger audiences, "Bears" is a nonetheless earnest, adorable real-life adventure. 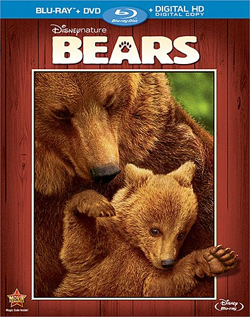 There are no two ways about it; Disney's 1080p digital transfer of "Bears" is astonishing, easily one of the year's very best high-definition offerings. The snowy vistas, rocky landscapes, grassy meadows, rushing rivers and torrential rainstorms are so vivid that the screen becomes a virtual portal to the real places and climates in Alaska. Every strand of fur is so clear the viewer will feel as if he or she can reach out an stroke it. Try all you want, folks, but there isn't a flaw to be found here. The 5.1 DTS-HD Master Audio is almost equally superb without a trouble spot to be found. The mix is full and even and boisterous without becoming distorted or overpowering. Were that not enough, when Phillip Phillips' "Home" arrives on the soundtrack, it is a winningly immersive moment. As a feature film, "Bears" isn't unequivocally great, but it will be an ideal choice for families looking to introduce their kids to the nature documentary format. Furthermore, Disney's high-definition release is essential for DisneyNature enthusiasts, or anyone looking to stock up on surefire home-theater demo material. A bunch of brief but substantial special features delve insightfully into the daunting undertaking of this particular project. "Bears" on Blu-ray is well worth picking up.